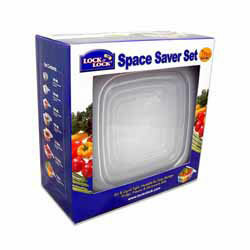 This Space Saver Set contains 1 x 100ml, 1 x 260ml, 1 x 520ml, 1 x 950ml, 1 x 1.6litre, 1 x 2.5litre and 1 x 4litre containers. "Dear Spices of India, I wish I'd known about you sooner as having lived in France for the past three years, it's extremely difficult to source these ingredients. Fast service and well packed. Throughly recommended!!"